hi my name is Adeel and i have a 10 months old pure female gsd. her hind legs cross when she walks i consulted a vet but he told me that it is not hip displysia but she has not been given proper walk . so i have to ask that if walk is really gonna help my female's hind legs even if she is turned 10 months old? 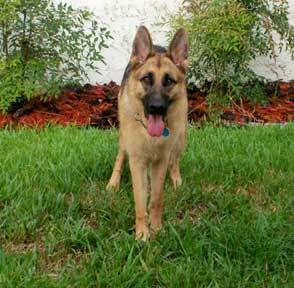 Even though your German Shepherd puppy is 10 months old, and probably looks pretty mature, she is still just a puppy. And it is not uncommon for puppies of any age to be clumsy and walk kind of oddly. Maturing GSD pups do have a degree of laxity, or looseness, in the joints as they are maturing to allow for growth. So for a while, yes, they do often walk kind of oddly. They are growing at a tremendous rate and as they do they have to constantly try to get used to bigger feet than they had a few days ago, longer legs, a bigger body, a longer tail - you name it. So they never really get a chance to get used to a particular gait because so much is changing in them size wise from day to day and week to week. If your vet has checked your German Shepherd puppy and has cleared her health wise then I wouldn't worry too much about it right now. She'll eventually grow into those longer limbs and get used to them and as she does she'll get more agile and sure of her own body and less clumsy too.